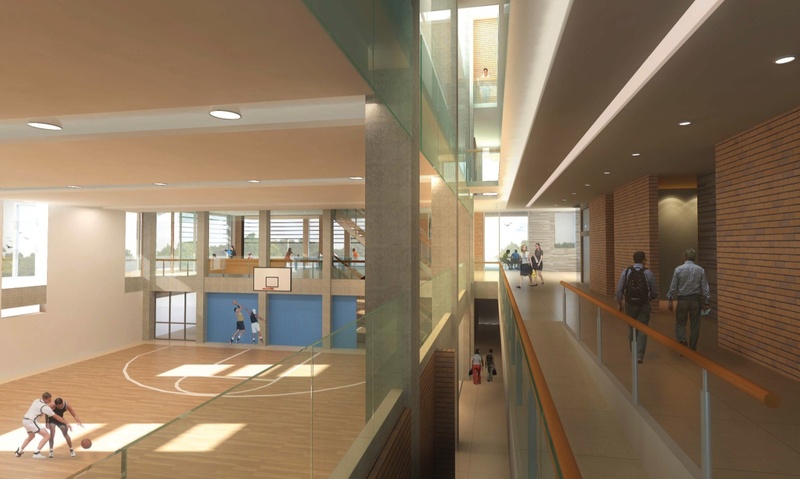 On February 22, the Toronto and East York Community Council will be reviewing a proposal to temporarily narrow Wabash Avenue beside Sorauren Park for 20 months to accommodate construction of the new four-storey condo building at 35 Wabash Ave. The meeting starts 9:30 a.m. in Committee Room 1 at City Hall. City staff have submitted a report on the proposed street changes. Councillor Gord Perks has advised he will be asking for changes to tighten the affected area. The plan below shows the proposed changes. Two-way car, pedestrian and bicycle traffic would be maintained at all times. The restrictions would last from February 27, 2017 to October 31, 2018. Thanks to a strong community response and leadership from the Roncesvalles-Macdonell Residents’ Association, Metrolinx has changed its plan that would have seen up to 30 dump truck per day rumble along Wabash, Macdonell and Rideau for track construction. Metrolinx has found an alternate solution and will not be using our local streets. 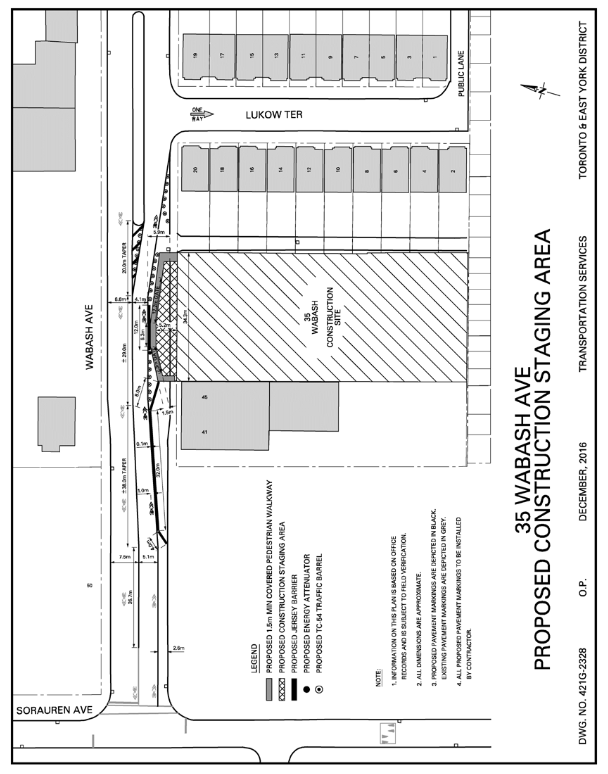 Metrolinx will continue to use the 40 Wabash Avenue site (behind the linseed oil factory) to store their work materials but will access the site from the rail side. The work is expected to start very soon and last until the fall 2014. The construction is related to the expansion of the Kitchener-Georgetown rail corridor with more tracks to accommodate the new Union-Pearson Express air-rail link and expanded GO train service. Read Metrolinx’s Response_to_May_22_ Community_ Meeting regarding the construction. Councillor Gord Perks is holding a meeting to discuss the Metrolinx proposal to use the area behind 40 Wabash Avenue as a staging area for track work. 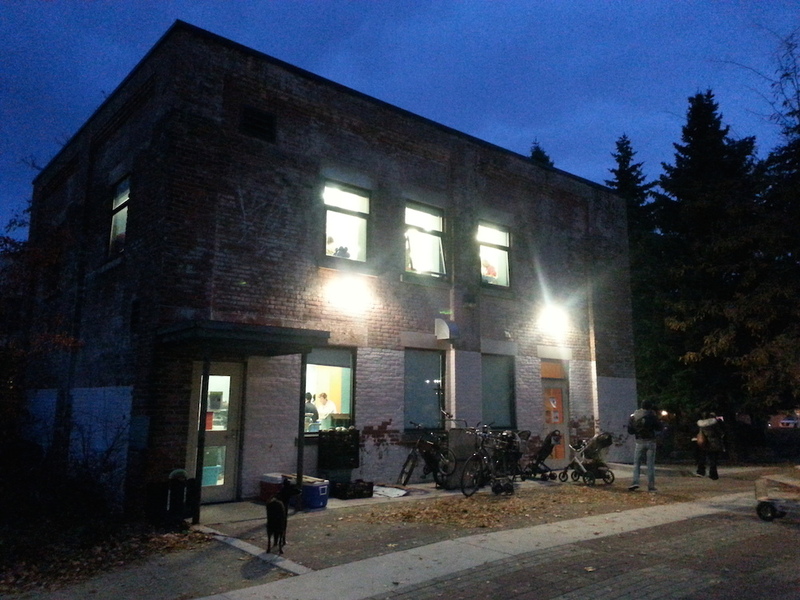 40 Wabash Avenue is the address of the abandoned linseed oil factory, the future community centre, and the land is owned by Parks, Forestry and Recreation. The access point is at the intersection of Wabash and Macdonell. Metrolinx says it needs the space for approximately 20 months, starting this June, and predicts up to 30 dump trucks a day on neighbourhood streets during peak times. For more information, visit the Roncesvalles-Macdonell Residents’ Association website. Wednesday May 22nd, 2013 7:00 p.m. – 8:30 p.m.
Councillor Perks, Metrolinx and Parks Forestry and Recreation staff will be reviewing details of the proposed staging area.